A while back we asked for help in compiling a list of readers' recommendations for top ice cream shops. We didn't get too much feedback (thanks to those of you who did help! ), but we still want some to know where your favorite place is! Make a suggestion here by November 16th, and you could win a copy of Ben & Jerry's Homemade Ice Cream & Dessert Book . Help us out and you could be a winner! And suggesting a Ben and Jerry's shop does not get you bonus points...we are actually after more of the local, "hidden gem" scoop shops! To be entered as a winner, please be sure to include your email address on the form. And not to worry. If you already helped us out, you will still be entered into the drawing for the book! One of our favorites, Guinness- milk chocolate ice cream as a milkshake. Genius! 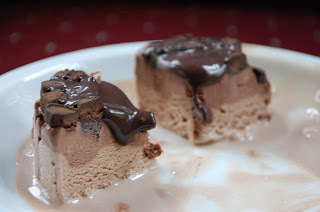 This is a take on David Lebovitz' Guinness-Milk Chocolate ice cream. I love that flavor, but was looking for something a little different for a party I was having a few weeks ago. 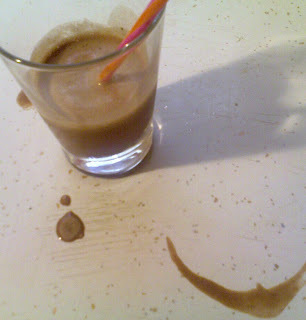 I wanted a dessert-slash-adult beverage so I started with his basics and came up with a Chocolate Guinness Milkshake. It's a two-fer! Boozy and desserty! So tasty and unexpected. It's doesn't really taste like beer, more like the richest brownie you ever drank. I made it in the ice cream machine because it really does do 'frozen' cocktails well, but you could easily do this in the blender. Warm the cocoa powder, 1 cup half & half, sugar and salt in a saucepan. In a bowl whisk the egg yolks together, then slowly add the warmed mixture to the yolks, whisking quickly. Once incorporated, pour mixture back into the saucepan. Let the mixture warm again over medium heat, stirring constantly until it is thick enough to cover the back of your spoon. Remove from heat and add the chocolate pieces. Whisk until the chocolate melts. Strain the mixture into a large bowl and whisk in the remaining half & half, amaretto and Guinness. Chill thoroughly in the fridge. It should only take about 15-20 minutes of churning (depending on your maker) to get this to milkshake consistency. Plunk in a straw and enjoy! See how two friends with a passion for food turned a little Vermont ice cream shop into one of the most famous names in the business tonight on "Biography on CNBC: Taste of Success" at 10P ET. After a crash course in ice cream making, Ben Cohen and Jerry Greenfield opened their first store. Unsure how to retain customers after the hot summer months ended, they used wacky promotional tricks to entice their customers to return. Now, Ben & Jerry’s is a company on a mission to mix social activism and business…and at the same time, turn a profit. 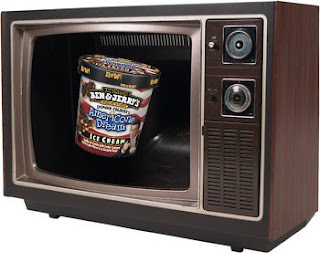 Watch Ben & Jerry's biography tonight at 10p ET on CNBC. Visit Biography on CNBC for web extras. Ernie (the pup) and I are watching some of it now while I post and he rests his head on the keyboard. It's late though and I am tired so I won't get to finish watching...but I can't wait! I am also especially intrigued by their desire to promote social responsibility. I'll watch my recording later this week. I am especially interested to see how they show the sale to Unilever. Don't worry. You didn't miss it! I am told it re-airs Sunday, October 11th at 11PM Eastern Time and Wednesday, October 21st at 12AM Eastern. Here's a little side note: Ben's daughter Aretha has an extra special birthday: July 31, 1990 -- so when I was celebrating my eleventh birthday, Ben was celebrating the birth of his new baby girl. Oh, and Jerry has a son named Tyrone...I'm sure those kids have a pretty "sweet" life. Well, be sure to catch it next time it is on! It's quite a treat! So funny and how true in the world of ice frozen yogurt/ice cream. So here lives Frolick ("fro" and "lick"..love it!) and the creator of these awesome pins. Well not really here since if you are visiting Singapore soon then you can actually try it but none the less its a fun spot we've heard about and had to talk about. Who knew a fro-yo place could be edgy, anti-establishment, fun, politically incorrect, and health conscious all at the same time. Move over Pinkberry with your holier than thou attitude. Note...I have never had Pinkberry and do admire the brand but in tough times we all need something to make us smile and Frolick sure seems to do the job. If only it was nearby. Not sure how I even came across this place but its about time someone put the fun in frozen yogurt. Is their a reason one must feel like raising their pinky when they eat frozen yogurt? Well Frolick figured out that ice cream's skinny friend, frozen yogurt, could let its hair down once and for all and be good all at the same time. Check out their web site to see what we're talking about. As for the yogurt, according to their web site, tasters claim it to be tart and refreshing. In the world of fro-yo that surely is no differentiator but their vision sure is. Unfortunately we can't visit a shop to truly see if this fun brand that lives online is actually carried out in stores and lives up to the raves but I get the feeling it wouldn't disappoint. And as for these fun pins, get em while they're hot on their site. What are the odds we can find someone who has actually tried this? If you are that lucky person I am sure we have some prize for you (well maybe if you can prove it!). A while back we got an email from Quinn Strassel at The Mitten, a Michigan-based culture and food blog. He told us about Superman Ice Cream and the write-up/video he did on it, his own interest being inspired by the article in Serious Eats. Quinn's video is not to miss, with a question-and-answer from an ice cream man and his son, a cute curly haired little girl, Miss Pigtails who hopes Superman will swoop down and take her away as she eats the ice cream, and of course, Quinn's very own history with the ice cream. Superman Ice Cream: A Michigan Specialty from John McCarthy on Vimeo. While Quinn explains it as, "A Michigan Thing," east coasters aren't totally out of luck. I think I saw it on the menu at Yum Yum's in Sea Isle City, New Jersey. His research piqued our interest, especially since he talks about Blue Moon Ice Cream (another "not-very-East-Coast" thing) that we wrote about a while back. Rumor has it that Blue Moon Ice Cream might be one of the mystery flavors in Superman Ice Cream. Since Quinn is the expert, without further ado, I'll send you over to his posting to learn more about it. Oh, and Quinn? Props from your New England pals for the fella in the Red Sox hat! When I was little, my grandmother used to make a lot of things: soft sculpture murals, cookies shaped like Santa, an Easter ham carved into the shape of a bunny...this is only a small listing of her accomplishments. She was quite a talented woman, my late grandmother, and my parents suggest this is where I get my artistic talent. What does Grandma Schlegel have to do with this ice cream blog? The inspiration I found from her Black Forest Cake: chocolate cake with canned cherries and whipped cream. When I got a sample of Amy's Organic Cake in the mail, I thought of a perfect way to use the cake...Black Forest Ice Cream. I have always been a fan of Bruce Weinstein's Chocolate Cherry Ice Cream recipe, so I churned up a batch of this and added crumbled Amy's Organic Chocolate Cake to the mix in the last five minutes of churning. I probably used about a cup of crumbs, which left me with a good amount of cake just to eat on my own, so I really could have my cake and eat it too! While Amy's Cake was moist and delicious on it's own (see Tina's post from last week) it also blended in wonderfully with the ice cream and saved me from making a chocolate cake. While I would make this ice cream again in an instant -- it was one of my favorites from I Scream 2009 -- I would also serve this cake on it's own. Both it's presentation and taste, texture, and moistness put it on my "emergency guests" list of foods -- that's assuming 1. I don't eat it first and 2. I remember to take it out of the freezer in time! So Oooey and Gooey...so Good! 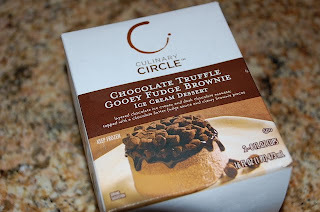 How can anyone pass up an ice cream dessert that has the words "truffle" and "Gooey" and "Brownie" in its name. Oh and did I forget "chocolate" and "fudge"! Seriously what doesn't this sweet little treat have in it. When this was sent to me I opened the box and a light shined upon two boxes of Culinary Circle's Chocolate Truffle Gooey Fudge Brownie Ice Cream Dessert. So what to do but immediately tear one open and break out my spoon. The picture on the box made this look way to good to save for later. I must say this was quite good. 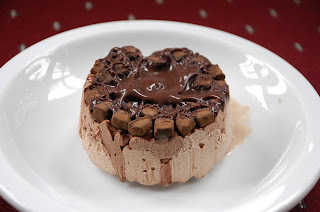 The ice cream which was layers of two different chocolates was super creamy and it was topped with lots of chewy truffle brownie bits that sat amongst a pool of gooey fudge. My problem was that I couldn't stop eating it and seriously finished it myself. Hard to tell the size here and when you open it it surely looks like one person could easily handle this but really its for two and I had a big ol' belly ache after devouring it all on my own (but I was eating for two at the time so its okay right?!). One tip I would have is to let it sit and thaw slightly for a few minutes to allow for the fudge topping to become a smoother consistency. Regardless its good but this allows for it to flow better and not be so thick. I do have to say if you put this on a fancy plate and drizzled some fudge swirls on the plate you'd think you were in a fancy restaurant. And actually that is what the brand is trying to achieve...."With chef inspired cuisine that mirrors today’s most popular restaurants, Culinary Circle is transforming creative casual dining at home." I'd definitely serve this to my guests and actually did. They had the same reaction...super good, rich, and sweet. This is definitely a chocolate lover's dream! This was sent to me and I had never seen the brand before so not sure exactly where to lead you to get it but the site does have a store locator. Unfortunately it gave me addresses but no store names but there are store logos on the site that may be near you. Looks like they sell many other yummy looking prepared foods for the busy cook that could be worth checking out. If the quality and taste are as good as this sweet treat I might have to try them myself.